This is a painting I did several years ago. I love to paint people. Painting people in wonderful places is even better. Paintings that say something about the human condition are the most rewarding of all for me to create. 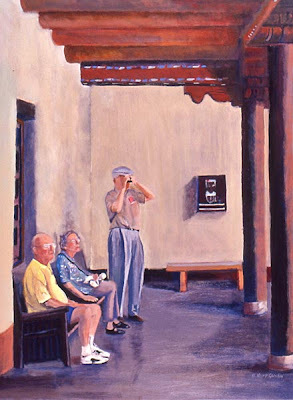 This little group of elderly people were sitting in the courtyard of a museum in Santa Fe. It's called Waiting for the Grandchildren. What does it evoke for you?